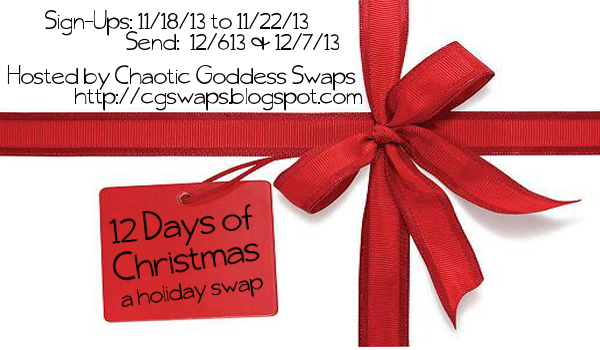 The day to host The Big Reveal from the 12 Days of Christmas Swap has come!! And oh man did I get the best partner ever! I got paired with Amelia who blogs over at Ameliaesque (love the blog name!). She is quite funny and, judging by her Facebook status updates, she has one amazing family! Amelia and Wendy sure sound like a lovely couple who truly love each other. So, after a few emails sent we got a grasp of what we liked. I learned that Amelia loves coffee -just like me!- and that she loves whimsy stuff and has a heart for vintage amazingness…among other stuff but the lack of sleep is not helping my writing/thinking at this very moment. Want to see what I got her? This is her big reveal! For the Christmas Swap we were to send 12 separate gifts to our partner and this is what my loot looked like when it came in the mail! Sadly, these were the only gifts under my tree for quite a few days until we got all our other gifts in the mail. But hey, at least it looked festive down there!! Day 1. This is, hands down, the cutest ornament I have ever seen! And now it is all mine. I love it. Makes me want to make my own next year…maybe make a baking themed tree? Day 2. This gift looked like a wedge of cheese…but it was non other than one of my favorite chocolates: Lindor Truffles! Yumms!! Day 4. COFFEE!! Yup, that’s all I have to say. Coffee!! Day 5. Cute cards that will come in handy to write to my sister who will be going to Congo in a few months! Day 6. Chocolate!! i must confess, not a big fan of this chocolate since it had marshmallows, but, Amelia my son was very glad to eat it!! He loved it! Day 7. Day seven was my favorite of them all!! The Luxury Body Creme is divine! It smells deliciously, grapefruit and tangerine, and it makes my skin feel healthy and oh, so smooth! Oh, there were some bath fizzle thingies (what are their names) as well. You know, for when I take a bath (which rarely happens). Day 8. More warm and wintery yumminess!! S’mores Cocoa Mix and Red Velvet Cocoa Mix! I’m very picky with my hot chocolate…but I cannot wait to give these two a try! Day 9. I got a lovely coaster with the outline of a state, which? No clue. (Help here). Love the background paper. Definitely going in my office. Day 10. The 10th gift was a handmade gift! A great way to remember this fun swap! Day 11. I received a lovely purple scarf!! Two of my favorite things in one: the color purple and scarves! 😀 Hey, a girl can never have one too many of them!! Day 12. On the very last day I got this amazing coffee mug that says WRITE. It is no secret that I would love to write a book. Maybe this mug will help me find the inspiration to finally begin a novel this upcoming year! Thank you Amelia for all my goodies! Love them all 🙂 I had a lot of fun. I might just have to join next Swap, and so should you all!! Nice gifts and so very thohgtful ones! What a great idea! How fun to do a gift exchange! What fun gifts! I like the mug that demands that you write something… good to start your morning with some inspiration! Holy cow! What a fantastic package! Your partner rocked! Thanks for joining us! I love that ornament! I might have to make some next year too. Your partner did a wonderful job packaging your box! She hooked you up on the warm beverage. World Market’s stuff is the best, and the mug is awesome!